When we stopped by at Seven Eleven, there're 2 new Slurpee flavors. One of them was Birthday Cake Slurpee and another was Sour Patch Redberry. It's 50th anniversary of Slurpee this year, and they made this limited time flavor. This Slurpee was pale yellow and it had pineapple and coconut flavors like Piña Colada and refreshing. 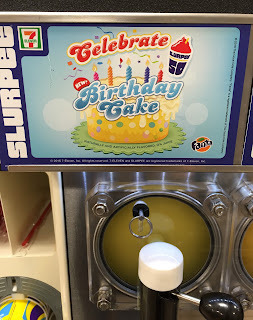 I kind of tasted spongecake, but it could be because of the name, "Birthday Cake" and made me think it was a cake flavored Slurpee. Apparently, it's a combination of traditional birthday cake and vanilla ice cream, but I didn't taste either of them that strongly. I also got Sour Patch Redberry, and I liked the Sour Patch flavor much more.